Notice a pattern? All trucks, all the time in this house! I had always heard that kids go through phases. The truck phase. The dinosaur phase. The princess phase. And so forth and so forth. But it's not until you're in the midst of it that you realize how all-consuming it is. Obviously, my household is currently living through the truck phase. This is the first time I've experienced being a parent of the same age group I'm writing books for. It's a rather strange thing. Every night we read three books, and my son always requests at least one book he specifically wants to read. The rest are up to me, which allows for some variation. Thankfully, most of the books he loves, I love too. But then again, I do this for a living so I'm picky about what I add to our home library. Over time I started to notice a pattern amongst all the books he loves. And no, it's not trucks. 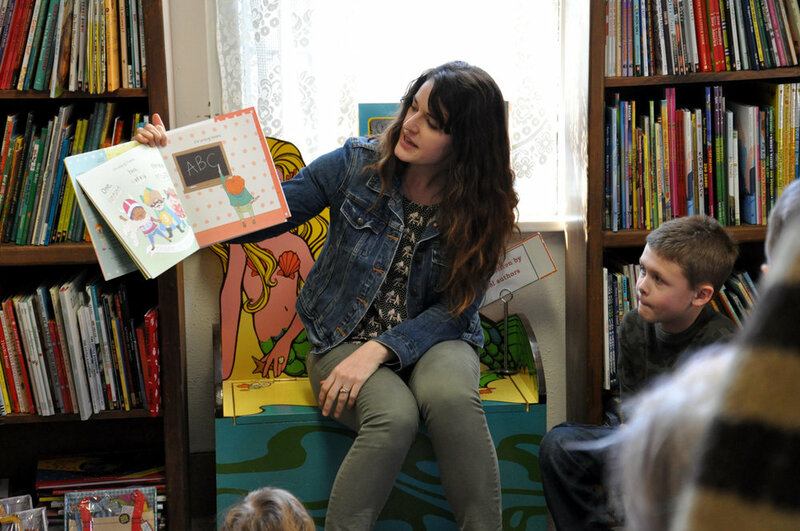 We do actually read books without trucks in it...sometimes. Trucks or not, all the books we end up reading together over and over again offer additional details in the pictures for my son to spot. He pours over each page, trying to find Goldbug (Cars and Trucks and Things That Go) or Zombie Truck (Monster Trucks) or identifying all the different types of trucks (Truck Truck Goose). More importantly, though, he can connect to the characters. He's at an age where he understands wanting to help (Little Blue Truck), being sad or protective (The Digger and the Flower), getting confused (The Mixed-up Truck), or being impatient (Sheep in a Jeep). All of these books have total kid appeal. Does it get cuter than Betsy Snyder's elephant driving the fire truck on the cover of Tons of Trucks? No, it doesn't. Could you get a better hook than Anika Denise's Monster Trucks? Nope. Because kids LOVE monsters and trucks! It's brilliant. We literally read that book on repeat. The 2-3 age is amazing. Kids are sponges, soaking up everything you give them. His memory astounds me and he is learning words at such a rapid rate. 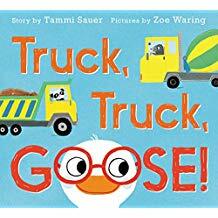 One night we were reading Truck Truck Goose, which if you haven't read it, only contains a few words. My son didn't know the word "piano" before reading that book. But he kept seeing Goose pulling around a big, red piano on each spread. Which is a hilarious thing to drag to a picnic in the first place. But that's what makes this book so great. Because kids drag around ridiculous things all the time. Like when my son goes to the potty and has to bring his monster truck with him. He's not going to play with it in there. He just wants to know it's close by. Like Goose and his piano. My son kept asking me what the piano was until he'd committed it to memory. Now we read that book and he points out the piano every time. The word piano isn't even in the book. But the story and illustrations provided him with a new vocabulary word and an interactive way to learn it. Now that's pretty cool. So what does this all mean? It means don't underestimate kids. Ever. THEY ARE REALLY SMART. Seriously, they pick up on everything. 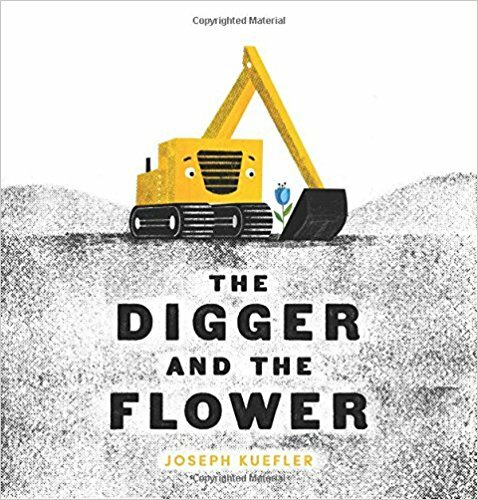 Recently, I had a conversation about using the word "digger" vs. "excavator" in one of my books. The concern was that kids might not know the word "excavator," which is a fair point, some may not. 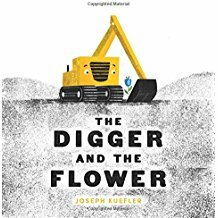 But in all the time I've heard my son talk about trucks, he's never once said "digger," unless he's referring to a name like Digger in The Digger in the Flower. Because he knows it's an "excavator." It's like those kids who can't spell their own name, but they can rattle off the most ridiculously long dinosaur names, unpronounceable to most adults. Unless of course, your household is going through the dinosaur phase...in which case, kudos to you! So if you don't have a kid on hand to watch like a science experiment for your next book idea like I do, then you need to do your research. Read everything you can get your hands on in the age group you are writing for. Which books are doing really well in that group? Which books aren't? Find the pattern, then find the hole and figure out how you can fill it. 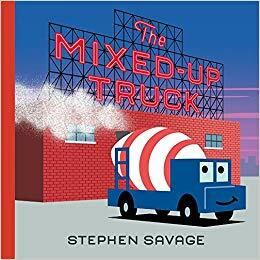 I don't think I would be creating a wheel-based board book series with HarperCollins next summer if it weren't for my two-year-old and his obsession with wheels and all things trucks. It's a strange thing to be raising my market, but I'm having a blast. What's up on deck? Check back next Thursday for an interview and giveaway with GO FISH and KNOCK KNOCK author Tammi Sauer!